Pick a solid wood desktop from more than a dozen styles and finishes. Our tops are genuine wood, some with a beautiful natural barkline edge. Determine which direction you want to face in the room. We recommend choosing an extension on the same side as your dominant hand. UPLIFT Sit-Stand Desks are available in the following standard sizes. Call us at 800-531-3746 for a quote on a custom size wood desktop up to 96" wide. 66" x 66" x 30"
Delight your desk sensibilities with the UPLIFT Height-Adjustable L-Shaped Solid Wood Stand-Up Desk, now available with a design your own option to get you working more ergonomically. Experience a one-of-a-kind desk that elevates your work style and gives you benefits like better circulation and improved productivity with one major office annexation. This is a work-changing 3-leg desk to take you to new heights, lifting up to a hefty 530 pounds of desk equipment with no issues. Give yourself the large, luxurious desk of dreams with the introduction of the UPLIFT Height-Adjustable L-Shaped Solid Wood Standing Desk to your workstation. A quiet electric motor in each leg lifts and lowers your desk to your preferred working positions, letting you sit and stand for better work and health overall. A three-stage desk frame raises and lowers the desk 33% quicker than two-stage frames, saving you time when adjusting for height. Design your ideal desk, starting with over a dozen handcrafted solid wood options like ash, pecan, maple, white oak, cherry, walnut, and premium carbonized bamboo, just pair with your choice of frame for an even more personalized desk to keep you inspired. I upgraded to the advanced keypad, and when I touch one of the presets my desk only moves a little bit. Is something wrong? Your memory presets are probably working just fine, odds are that you have an older control box. To recall your preset heights, you have to press-and-hold the memory setting until your desk reaches standing height. This is for safety, since the older UPLIFT 3-Leg Frame did not have the ability to sense an obstruction and stop. If you see the number 99.046.14.0070 printed on the sticker located near the power socket, then your control box is capable of one-touch memory preset function and may need to be reset - see our Programming Your UPLIFT Desk PDF for instructions on locking the keypad, changing the memory presets from one-touch to press-and-hold, and setting new lower or upper height limits. How can I tell what version of control box is on my desk? It's easy. You can check to see which version of control box you have by glancing at the silver label on it. If that sticker says v4.1, v4.2, or v4.3, you have the newest version of UPLIFT Desk's control box, complete with a few new features to enjoy on your desk! The latest version of UPLIFT Desk's control boxes comes with several exciting new safety features, like Collision Sensitivity, Keypad Lockout, and the new ability to toggle between One-Touch and Constant-Touch modes with a few buttons. You can read about how to use these new features on our blog post about the subject! In order to add an extra layer of safety to our desks, UPLIFT Desk designed their latest version 4.1 control boxes to be able to be locked so children and unwanted users cannot adjust it when this feature is activated. To lock the keypad, press the "M" button for 5 seconds until the LED switches to "LOC", then press and hold the the "M" button to turn on the lockout feature. To unlock it, just press the "M" for 5 more seconds. Is there any difference between the bamboo desktop offered here and the bamboo corner desk? The bamboo on this desktop is a hefty 1.5" thick, versus 1" thick on the other Bamboo Corner Desk. This is made out of premium Moso bamboo, which is a more mature bamboo, giving it even more character and stability. Solid Wood desks are custom-made after you order and therefore will ship out in 12-14 weeks. Carbonized bamboo is bamboo that's been treated and "caramelized" to transform the desktop into a beautiful honey-caramel color. All of our bamboo desktops are constructed out of carbonized bamboo. Can I customize the size of the desktop to fit my work area? Yes, since each Solid Wood Corner Desk is handcrafted after you order, you can have it made to your specifications. Give us a call us and let us know your dimensions down to 1/4 inch and our woodworkers will craft your desk to your specs! Can I get my desk any faster? Like our other UPLIFT Desk Solid Wood Desks, this desk is crafted by hand after each order that is placed. A Solid Wood Desktop needs a little time to cure and finish before we can ship it to you, but we think waiting a bit makes the big delivery day just that much more special. Can I get my Solid Wood Desktop made in one piece? Due to shipping constraints, UPLIFT Desk Solid Wood Desktops come in two pieces. Your desk will ship free via freight carrier, which comes with handy curbside delivery. Solid wood is an surprisingly durable material. Desktops continue to harden naturally and become even more durable over time. How do I clean my desktop? Keep your desk well-hydrated to prevent it from drying out and cracking. When you happen to make a desk mess, our Solid Wood Care Kit includes lemon oil, buffing towels, and a steel wool pad to help you restore your top. For regular desk maintenance and less drastic spills, just wipe your desk down with a damp rag. Can you speed up the shipping process? Due to the fact that each desk is custom-made for you after you place your order, we cannot cut any corners to get you your desktop faster. However, we do have a variety of quick ship L-shape desks that may meet your needs if you need a spacious desk now. Why is the color of my desk a little different than the wood I chose online? Did I order the wrong wood? More than likely, you didn't order the wrong type of wood! Immature woods sometimes appear lighter or darker than their older timbered desk counterparts. Over time the color of your desktop will balance out, giving you a stunning desk you can be proud to work at. Can the frame secure and hold a very large corner desktop? The UPLIFT Desk 3-leg frame offers a huge lifting capacity of 530 pounds, meaning it can handle quite a bit of desk weight. Reaching that working sweet spot is no problem, fluidly adjusting your corner desk to your sitting and standing preferences in seconds. Will the wood crack over time? Dry climates are more susceptible to warping and cracking, so it's important to keep your desk adequately hydrated with lemon oil, which can be found in the UPLIFT Solid Wood Care Kit. How are the two desktop pieces held together? You can secure the two pieces of your Solid Wood Desktop using two included brackets. There will be a center seam where the desktops fit together; just make sure to precisely line up the two pieces of the desktop during installation to minimize this gap. Is the surface of the desk smooth? Solid Wood Desktops may contain some minor imperfections, such as knots or bug holes. Our woodworkers will fill in the surface with clear or black filler to smooth out your desktop to perfection. Will I be able to assemble my desk by myself? This desk is pretty heavy and may require two people to lay out your desktop on the floor safely. Though assembling and attaching the desktop pieces together is a one-person job, you will need a friend's help to set your desk right-side up after assembly. Can I get some wood samples to help me make up my mind? Order the Solid Wood Sample Kit to get an up-close-and-personal look at what each wood species we offer looks like in real life. Do I have the option to order my desk with a curved corner? At this time, we do not offer a curved corner desktop with this desk frame. All UPLIFT Desks are made to run on the US electricity standard, which is 120 volts. If you're ordering an UPLIFT Desk from outside the United States, excluding Canada, you'll most likely need to plug your desk into a step down transformer, otherwise you run the risk of overloading your desk's control box, which is not covered by warranty. If you have any questions, please don't hesitate to call, email, or chat us. Does one-touch functionality on the advanced keypad let me save my desk heights? You bet! Our newest line of control boxes for 3-leg desks features one-touch and constant-touch capabilities! You can even toggle between the two! One-Touch requires only a single touch of the “1, 2, 3, or 4” button to move the desktop to a preset memory location. Constant-Touch requires a continuous touch of the “1, 2, 3, or 4” button to move the desktop to a preset memory location. Constant-Touch is the default setting. All UPLIFT Desks come with a motor in each leg, so three for 3-leg desks. This makes the desks quieter to raise and lower, stronger, more reliable, and safer than desks with just a single motor. When you're updating your workstation, don't forget the little details that make UPLIFT Desks better than all other desks available on the market today. What is all this talk about three-stage frames? Well, for starters, UPLIFT Desk frames are three-stage vs the traditional two-stage desk on the market today, which means these desks are a whole 33% faster thanks to 3 spindles instead of 2. 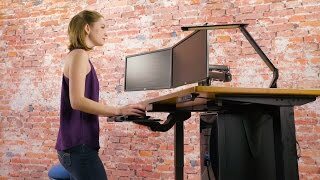 This means you have a higher adjustability range, so desks suit shorter users and kids, all the way up to very tall users or those who plan on adding a treadmill to their setups later! Had my L-shape desk for a two weeks now and let me tell you loooved it. I had these guys built mine customize to my needs. Pros: Really comfortable for me and made my life to be organize. Cons: Did not like the wait for the delivery. $2,304.00 List Price: $4,289.00* The list price is the same as the MSRP (Manufacturer's Suggested Retail Price). It may not necessarily be the price at which the product is sold. 60 > 60" x 60" x 30"